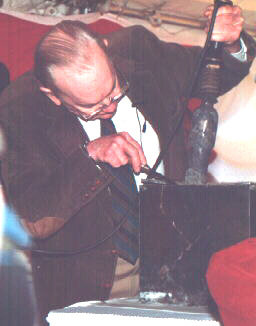 Photo: Ralph Williams unsoldering capsule. 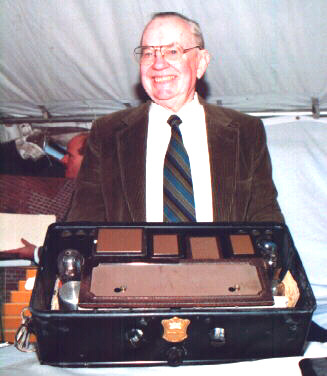 Opening the time capsule, sealed 67 years earlier by his Father and Grandfather, A. Atwater Kent III, (Click here for photo) carefully pulled the solder-sealed copper box from the large granite corner stone. After the press took their photos, the capsule was carefully carried to the front and placed upon the podium. Waiting, with the largest soldering iron this reporter has ever seen, was Ralph Williams, Atwater Kent Collector and Historian and Kent family friend. As the last of the seal was removed by Williams and the top lifted, a hissing sound of fresh air entering could be heard. Then it seemed like an eternity before the first artifact was removed. The time capsule was dedicated, on a beautiful spring day, May 21, 1929. It was attended by city officials, business men, bankers in top hats and the Atwater Kent Family. 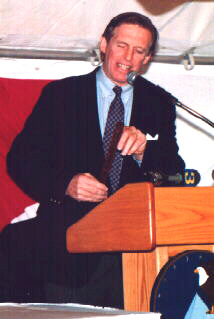 In a film provided by Great-grandson Peter Kent, the entire dedication ceremony could be seen. After all the documents and items were placed within, the copper box was soldered shut. It was next placed on a granite slab by A. Atwater Kent with the assistance of his son, A. Atwater Kent Jr. Mortar was placed carefully around its base and the large hollowed-out corner stone with a large 1928 carved into its face was put in place, over the copper box. As the supporting chain hoist slowly lowered the heavy stone, mortar oozed out and was quickly wiped off by Kent. Workmen then slid the corner stone into place where it remained, untouched, until today. Williams, assisted by Jeffrey R. Ray, Curator of Collections at the Atwater Kent Museum in Philadelphia, carefully put on their protective gloves, so as to not damage the artifacts. The first item removed was the dedication speech, written on index cards, in AKs handwriting. Williams noted that several words were underlined for emphasis. 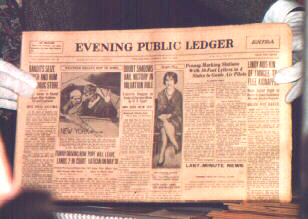 Several newspapers were next removed, starting with the Sunday May 12, 1929 Evening Bulletin. Then the Philadelphia Daily News, the Philadelphia Public Ledger, the Philadelphia Record and the Philadelphia Inquirer were removed; all dated May 21, 1929. Some of the papers faired better the others, over the time. At least one was like new, the others were in various stages of yellow and brittle. Photo: Ralph Williams with AK-55. The lid was removed and the 55 was tilted towards the audience to display the inside. We could see the tops of several tubes and the original instruction book tucked inside its envelope. Williams instructed Ray to remove the book and went on to describe the model 55 set. The table-top set had ten Cunningham globe tubes, used a separate speaker and was the peak radio [of the Atwater Kent line] of that period, Williams said. Concluding the ceremony Williams thanked Mr. Paul Chistolini, Regional Administrator of General Services and the General Services Administration, current owners of the building, for the sensitive treatment they used for this event. Chistolini went on to explain that the contents would be initially displayed in the new structure, housing the Department of Veterans Affairs located nearby. Later the artifacts would be loaned to the Atwater Kent Museum. We were then all invited to enter the old Atwater Kent Factory building to enjoy a lunch reception. NJARC members attending were: President Jim and Ruth Whartenby, Past-President Tony Flanagan, Vice President Ludwell Sibley - KB2EVN, John Dilks - K2TQN, Marsha and Jerry Simkin, Bill Overbeck, Mike Koste and Ted Sowirka - W3SYN. Members of the DVHRC attending were Dave Abramson, John Kern, Ralph Williams - N3VT, Paul Bohlander - W3VVS, Bob Thomas - W3QZO, William Ward - K3QWO, John Okolowicz and AWA Vice President Ron Frisbie. Other notables I was able to identify were AWA President Bill Fizette - K3ZJW, Jack Williamson - W3GC of Barker & Williamson fame, and AWA member William Denk. Click here to return to the website articles page. Click here for the NJARC HomePage.